The task of building a Locost scuttle (a.k.a. cowl, but we already had that discussion) is described well enough in the Locost book that you're pretty sure it can't be done. The book talks about flimsy sheets of metal and long thin strips of steel welded in air. It dismisses any difficulties with explanations like, "do whatever you need to do to make this work." I may be paraphrasing. Even so, building a Locost scuttle is not for wimps. As it turns out, however, the job can be split into two separate tasks. One is relatively simple. The other isn't, relatively or otherwise. Luckily we're doing the simple task now, which is great. We're making the scuttle frame. So far it's going well. Nothing about this task requires welding in air. 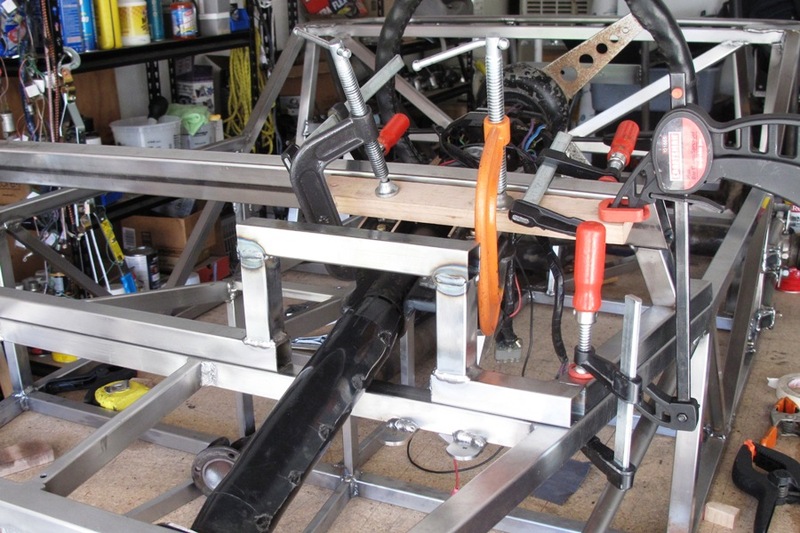 In fact, most of the work involves building a mount for the steering column. And yes, I know we already did that once, or maybe twice, but it turns out the Locost steering assembly has mounts all over the place. This won't even be the last one. In anticipation of building the scuttle, we took all the measurements and did all the design work and drew up all the plans months ago. Of course none of this was any use to us out in the garage, where we were faced with dozens of steel tubes (okay, six), meeting at all sorts of odd angles. What we really needed for this job was a jig, and one thing we're quickly learning is that the best jig for mounting parts to a Locost is very often the parts themselves. So we dug out the steering column, although we had to do some work on the scuttle before we could install it. Our scuttle frame so far consisted of just three tubes welded together: a forward tube and two side tubes. To clear the steering column, a section of the forward tube would need to be cut away. 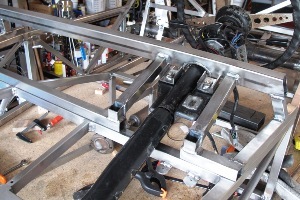 When the frame is finished, the steering mount will bridge the missing section. This will keep the frame structurally sound. 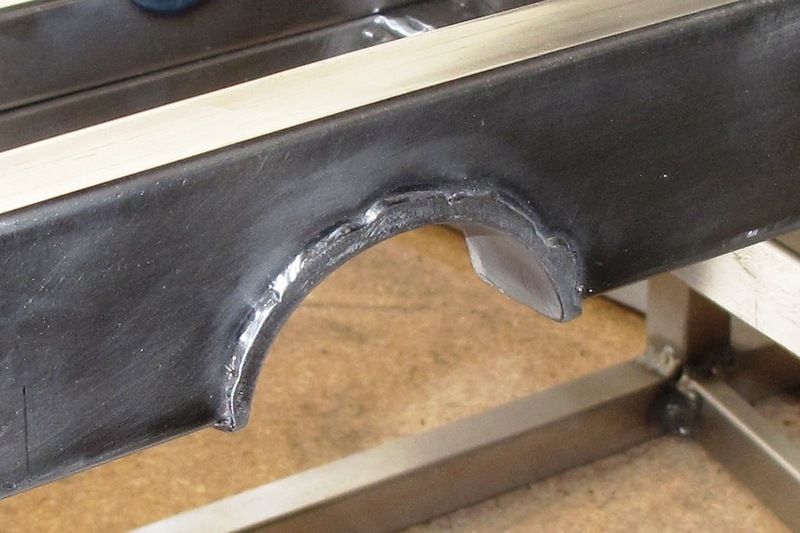 However, since we didn't have a steering mount yet, removing a section of the forward tube would cut our scuttle frame in two, which would make lining everything up--something that's almost beyond our fabrication abilities already--that much more difficult. So we built a temporary bridge over the section to be removed, then removed it. The section, not the bridge. Then we installed the steering column, which allowed us to cut all the rest of the scuttle tubes to fit, starting with the 42" main support tube. We made this piece from 1"x2" 16-gauge tubing, with a notch for the the steering column. A strip of 16-gauge steel would be cut and bent to fit the notch, and welded in place to seal up the tube. This turned out to be easier than it sounds. See photo. However, we did worry about getting the notch in exactly the right place on the brace. We took lots of measurements and made all kinds of Sharpie marks on the frame, then realized we could actually a) make the notch wider than it needed to be, giving us plenty of tolerance, and/or b) make the support tube longer than it needed to be, allowing us to center the notch over the column and trim the ends later. Of course either one of these options would've been immediately obvious to anyone who'd built a car before, and also probably anyone who hadn't. We ended up making the notch wider than it needed to be, although not necessarily on purpose. We used a can of Brakleen as a template for drawing the half-circle on the support tube, and it turns out that a can of Brakleen has a larger diameter than an MGB steering column, although they look very similar when you're not looking at them side by side. We also made the support tube a little longer than it needed to be, again, not necessarily on purpose, but the result was a well-centered notch, with plenty of clearance on either side of the steering column. So that's one more big welding job out of the way, although we still have to attach the top plate to the column mount and attach the scuttle frame to the Locost, but to do that we need to install rivnuts into the F and P tubes, and you can only do that with a rivnut installer tool. Which we don't have. So I guess we're done. Excellent. Time to move on.